The history of the surgery of baldness is marked, in the first half of the twentieth century, by certain tentative autoplastics, which are often overlooked [29, 31, 49, 65]. 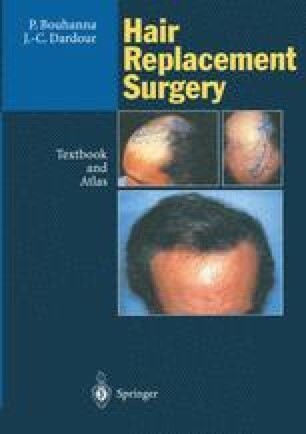 Then, after Orentreich’s report in 1959 , at which time the work of Okuda  (published in 1939) was still unrecognised, the technique of scalp grafts developed. As for the so-called pathogenic surgical treatments, these have never been more than palliative and ineffective procedures.